Been awhile since I updated the blog so just a bit of info to bring things up to speed. Still working 15 hours a day at the Crystal River 3 Nuclear Generating Facility. If all goes well should be out of here within a month.Has been a good opportunity to recharge the cruising batteries!! Really miss the time back on Le Chat Beaute. She is apparently doing well on Mariah's mooring as I had a call from Dave this morning. Same o, Same o back in the Virgins. Over the years I have been to the other side of Florida and found it to be the same hustle and bustle as most populated areas in America. Good for a week or so visit, but then one needed to get away. The West coast of Florida is much more rural and laid back. The weather is fairly decent and the natives are friendly.The amount of animal and bird life here is amazing. On the drive to work I see ospreys, herons and alligators! The easy availability of Stone Crab is one of the pleasures I enjoy each week. Stone crabs have very hard shells, thus the name. The interesting thing other than the flavor is they are not captured and killed. The fisherman twists off the claw and throws the crab back in the water where it grows another claw. Kind of a renewable resource. Did I mention they are delicious! While working the other night took a picture of this moth. 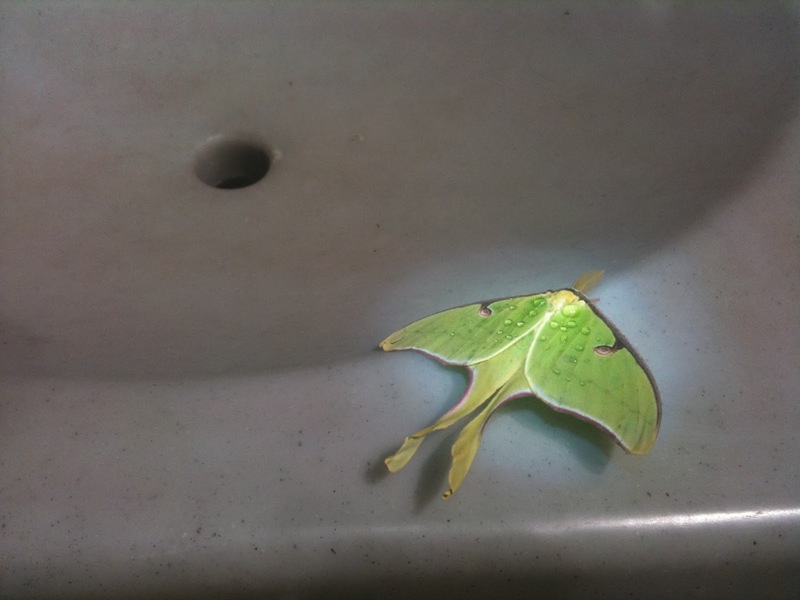 At first I thought it was a leaf and nearly crushed it as I was washing my hands. Turned out they covered a building here onsite. Mother Nature doing her best in the Sub Tropics.